Purple Pitcher Plant is native to swampy, humid regions of North America and is an unusual carnivorous plant you can grow indoors. Upright leaves are tubular, the tops slightly bent over like a hood. These "pitchers" contain sweet juices that lure insects. Once an insect is inside, it is unable to escape the slippery slope and is digested by the plant's juices. Pitcher colors and shapes vary by subspecies. S.p. venosa has dark purplish-red pitchers and bright green hoods with prominent purplish-red veins. S.p. purpurea is mostly purplish red with some green on the inside. No blooms? If you bought a young plant at the store, you won't see flowers on it for a few years. Be patient. Mature plants will send up flowers in summer. And they are spectacular -- rising above the pitchers on tall stems. Bloom colors vary by subspecies and may be dark red, purple or pink. Repot only when pitchers become too crowded. Use a deep, wide pot. Because of its unquenchable thirst, it's a good idea to pot Sarracenia purpurea in a shallow pot with drainage holes and place it in a saucer. Go ahead and water from the top, allowing the water to flow through the pot. You won't need to empty the saucer -- Purple Pitcher Plant will drink that up, too. Winter care. Purple Pitchers may go dormant in winter. Water just enough to keep the potting medium barely moist, but don't allow it to dry out completely. Keep them in bright light/direct sun year-round. Light: Purple Pitchers thrive in bright locations with some direct sun. Sunlight will deepen the red/purple color of their leaves. Water: Water generously throughout the growing season, keeping the soil evenly moist. Use distilled water because the chemicals and minerals found in tap water will harm the plant. Never allow the potting mixture to dry out. Humidity: Moderate to high (above 50% relative humidity). Set the plant on a humidity tray to raise the moisture around it. Temperature: Cool to average room temperatures 60-70°F/16-21°C. It will tolerate a minimum of 40°F/4°C in winter. 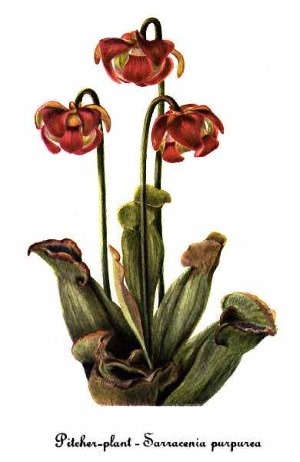 Soil: Sarracenia needs a medium that's free of nutrients and allows good drainage. Use a mixture of 1 part sphagnum peat moss and 1 part perlite or horticultural sand. 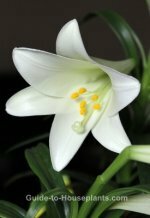 DO NOT use potting soil or compost because it will kill the plant. Propagation: Divide plants when they are crowded in the pot. Or sow seeds in spring.